DanceSport India has dance classes reach across the Western Line and is present in the hub of suburbs Andheri West. This caters to students from Vile Parle to even Goregaon. The dance forms covered at the beginner level there are Salsa, Cha Cha, Jive and Bachata. The beginner level batch is for 6 months only. Where the basics steps of the above mentioned dance forms are introduced to absolute beginners. The classes are conducted by experienced instructors! who make your experience filled with excitement and fun. That’s why it becomes impossible to miss any class. Dancesport India has the best Latin and Salsa classes in Mumbai. As they not only teach you the steps but they go beyond what all others schools do. They teach you to improve as a dancer and even if you have 2 left feet you will experience a drastic change. They teach musicality, this is inculcates rhythm in you, teaches you the essence of partner work so that you can really enjoy when you go out social dancing. 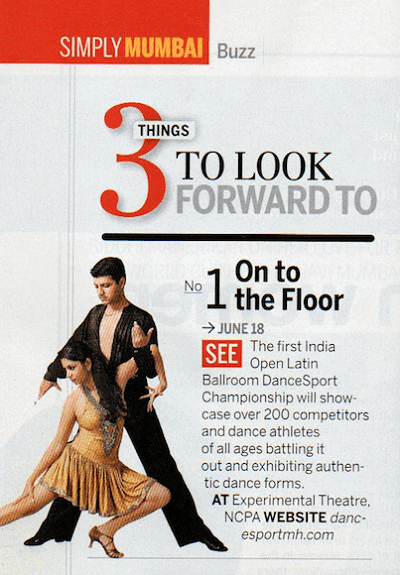 Dancesport India has the best foundation for beginners and non Dancers in Latin and Salsa. This is evident by the fact that in State and National Level Championships, their beginner level students performs & win the medals. If you really want to change as a dancer, this is the place to be. The syllabus of Cha Cha, Jive, Salsa and Bachata at the beginner level is till Bronze level, as per the ISTD, London. Hence wherever in the world you travel it you who able to fit in. Post completion of the 6 months, where you will be proficient in these dance forms. Cha Cha , Salsa, Jive and Bachata and will without any doubt dance better than your others. Also, you will graduate to the intermediate level batches, where Samba and Rumba dances are introduced. So what are you waiting for. Call and book your seat immediately on 9819950806. The charges for the 6 months is a nominal 4000 for 2 months with Rs 500 as a one time registration fees. If you enroll at the beginning you will be waived off the registration fees of Rs 500. Will be given a package rate of Rs 15000 for the entire period of 6 months.